Or try my s’mores chocolate chip cookie cake. Soft & chewy graham cracker cookie bars with chocolate and marshmallow swirls. If I could live off of one food for the rest of my life, it would be a s’more. The gooey marshmallow, the melty chocolate, the grahams. Technically that’s three foods, but stick with me here. I’d also live off of peanut butter, mangoes, and this carrot cake. I don’t know anyone who can resist a s’more. And if they can, their tastebuds must not be working properly. My infatuation with s’mores expands to brownie pie, chocolate chip cookies, puppy chow, PEEPS, peanut butter cookies, rice krispie treats, and 7 layer bars. Pick your poison. And yesterday, I wanted some more… s’more. I made a basic cookie dough, swapping some of the flour with graham cracker crumbs. The cookie part tastes like thick & soft graham crackers. 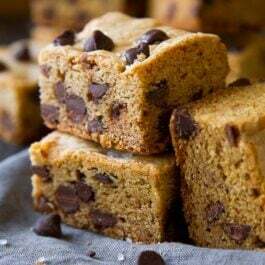 Almost like a graham cracker blondie – buttery, brown sugary, chewy, grahamy, and sweet. To make these, you’ll simply layer 2/3 of the graham cracker cookie dough into the bottom of a pan. Top with chocolate chips, marshmallow creme (Fluff), and then the rest of the graham cracker cookie dough. It’s a variation of your classic campfire treat. Simply bake everything together into a bar and you have a travel friendly, unique way to get your s’more fix. An important thing to note: do not use marshmallows in lieu of the marshmallow creme. The marshmallows will disintegrate into the dough, creating unpleasant looking craters, and become virtually invisible. You won’t really even taste them. I’ve tried that with cookies before. An ugly fail! Use marshmallow creme, which stands up to the heat of the oven. I love marshmallow creme and don’t bake with it nearly enough! Fluff reminds me of my sister, Sarah. Growing up, Sarah always asked for fluffernutter sandwiches and I stuck to PB&Js. 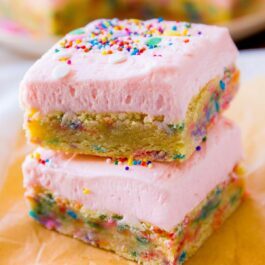 These cookie bars are SO soft. Kevin asked me how I got them to be so soft. “Did you underbake them like you do with your cookies?” No – I didn’t. The graham cookie layer just stays soft when baked for 25 minutes. The tops of my cookie bars got a little brown, so they aren’t underbaked. Just magically soft. They will melt in your mouth. I can’t decide which part I like the most. The melty chocolate? The gooey marshmallow? 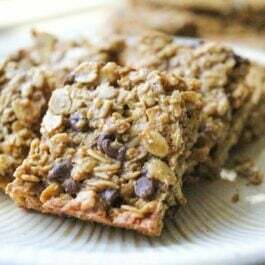 Or the soft & chewy graham cookie. I’m not really sure – it just tastes incredible when sandwiched all together. My tip to you: eat these warm! You’ll really feel like you’re next to the campfire on a hot summer night. Kevin’s coworkers are getting the leftover bars today. Guys, if you’re reading this… you’re welcome. And I’m sorry there aren’t that many leftover. I cannot resist s’mores!! Oh hi! Welcome to S’mores Mania. Preheat oven to 350°F (177°C). Line an 8x8 or 9x9 square baking pan with aluminum foil, leaving enough overhang on the sides to easily remove the bars when they have cooled. Set aside. In a large bowl using handheld or stand mixer fitted with a paddle attachment, cream the butter and brown sugar together on medium-high speed. Beat for about 2 minutes until smooth and combined, then add the vanilla extract and egg, beating until combined. Scrape the sides of the bowl down as needed. Set aside. Toss the flour, graham cracker crumbs, and baking powder together until combined. With the mixer running on low, slowly add the dry ingredients into the wet ingredients. Mix until combined. Press 2/3 of the graham cookie dough into prepared pan. Spread the marshmallow creme on top. This will be tricky since the marshmallow creme is so sticky, but do the best you can to get an even layer. (Sometimes I spray the bottom of a spatula with nonstick spray to spread it around.) Sprinkle the marshmallow creme with chocolate chips. Mold the remaining cookie dough into flat pieces and layer on top of the chocolate chips. You won't have enough dough to make one single layer, so some chocolate chips will be exposed. That's ok.
Bake the bars for 25 minutes, or until the top is lightly golden brown. Allow to cool completely with the pan set on a wire rack before cuttng into squares. Bars stay fresh covered tightly at room temperature for up to 1 week, if they last that long! I enjoy the cookie bars warmed up in the microwave for 20 seconds. Make ahead tip: Bars can be frozen for up to 3 months. Simply thaw overnight in the refrigerator, then bring to room temperature before serving. If using unsalted butter, add in 1/4 teaspoon of salt with the flour. Q: What’s your favorite way to eat a s’more? The real way, campfire and all?